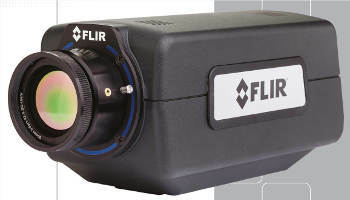 FLIR Systems announces the FLIR A6700sc – an affordably priced, compact thermal imaging camera designed for industrial R&D applications that need better image quality, more sensitivity and a higher frame rate than what can be obtained from a camera with an uncooled detector. The FLIR A6700sc incorporates a cooled Indium Antimonide (InSb) detector that operates in the 3- to 5-micron waveband. A broadband version operating on the 1- to 5 micron waveband is available. Both versionsproduce crisp thermal images of 640 x 512. Achieving a high thermal sensitivity of <20 mK, the FLIR A6700sc is able to capture the finest image details and temperature difference information. In addition, precise camera synchronization and triggering makes the cameras ideal for high-speed, high sensitivity applications. Working in snapshot mode the FLIR A6700sc is able to register all pixels from a thermal event simultaneously. This is particularly important when monitoring fast moving objects where a standard thermal imaging camera would suffer from image blur. The camera supports image frame rates up to 480 frames per second when operating in windowing mode. Using a standard GigE Vision™ interface to transmit both commands and full dynamic range digital video the FLIR A6700sc is a true “plug and play” thermal imaging camera. Custom cold filtering options for specific spectral detection and measurement are available. 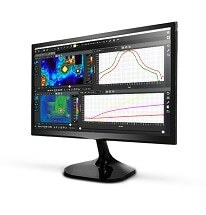 The FLIR A6700sc camera works seamlessly together with FLIR ResearchIR Max software enabling intuitive viewing, recording and advanced processing of the infrared data provided by the camera. 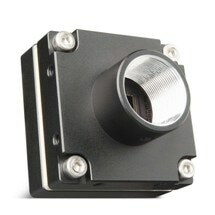 Each camera comes standard with this especially for R&D applications developed software. Whereas price is often a setback for acquiring a thermal imaging camera with a cooled detector, FLIR Systems is marketing the FLIR A6700sc, with FLIR ResearchIR included, at an extremely affordable price point. This will make it possible to bring the benefits of thermal imaging cameras with a cooled detector to many more researchers than before. For further information on the FLIR A6700sc thermal imaging camera please visit the FLIR website or contact FLIR Systems on +32-3665-5100 or [email protected]. FLIR Systems has seven manufacturing plants located in the USA (Portland, Boston, Santa Barbara and Bozeman), Stockholm, Sweden and Talinn, Estonia. It operates offices in Australia, Belgium, Brazil, China, Dubai, France, Germany, Hong Kong, India, Italy, Japan, Korea, the Netherlands, Russia, Spain, UK and the USA. The company has over 3,200 dedicated infrared specialists, and serves international markets through an international distributor network providing local sales and support functions.